Do you need professional key cutting services done on the spot? Locksmith Sylmar is your preferred choice, and we have a 24/7 emergency response team available 365 days a year. With cutting edge technology and pinpoint precision, we at Locksmith Sylmar can find a solution for every lock and security need. With just a brief description of the type of service needed, our bonded and insured technicians will handle the rest! With a lightning fast response time, Locksmith Sylmar understands that every second counts which is why we make our customers our top priority. Call or email Guardian Angel Locksmith in Sylmar today and we’ll get right to work! Accidentally locked yourself out of your car? Don’t smash the window! Our certified technicians use specially made lock picking tools to safely pry open any door. No mess, no glass, no problem! Throughout the procedure, no damage is ever caused to your vehicle. Our tools include tension wrenches and slim jim devices to gain access quickly and efficiently. We also specialize in damaged vehicle door locks or trunk locks on the spot. All our techniques at Locksmith Sylmar are designed to get you back on the road in no time at all! 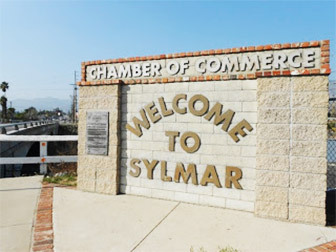 Locksmith Sylmar also services commercial buildings! Security solutions are always available and only 1 phone call away! Our associates can set up CCTV surveillance, install wireless outdoor security cameras, install high security locks, purchase safes or have your safes repaired or unlocked. Call us at (818) 652-5269 to learn more about any security camera system you might be interested in installing.